This stylish olive oil bottle favor will look great in your guests' kitchens while serving as a practical 'thank you" for your celebration. This re-usable olive oil favor is loaded with flavor! 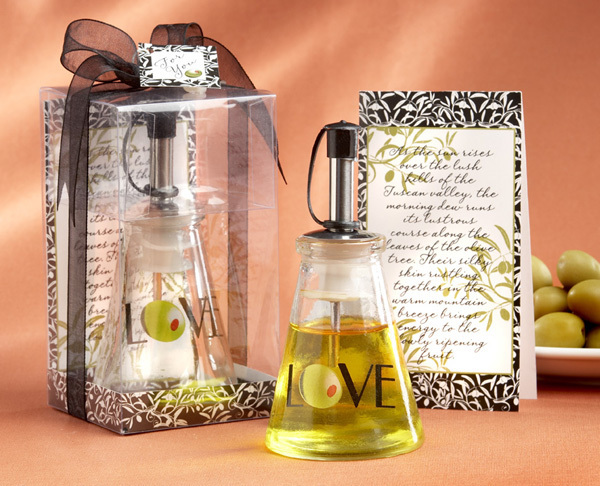 The oil bottle is presented in a beautiful black and white floral design gift box with a signature verse from the artist. A sheer black organza ribbon and olive tag also add a beautiful touch. Olive oil not included. This gift box measures 2.75" x 5" while the oil bottle is 2.25" x 5".